Our Translation, Localization and Transcreation services ensure that you retain the meaning you intend to convey in whatever language you need your legal document, medical document, website or marketing materials to be communicated in. Document translation is the art of converting one written text (from the source language) into another language we call the target language. Translation doesn’t have to be literal. In fact, most often the best translations are not literal, they are translated to conserve meaning but not necessarily say it in the same words in both source and target languages. This is where the value of human translation comes in, because machine translations or using an app or website to translate your text is unable to do anything besides a literal translation. There is no substitute for human translations when you’re trying to make sure your message connects clearly to your target audience. Localization is one step beyond translating to include ancillary details that make a translated piece look natural in the target language and target culture. It may include adjusting of imagery of people who look and dress like those who speak the target language. Localization may adjust coloring to avoid any color schemes that could possibly send mixed messages or convey unintended cultural meanings. Localization adds a creative element to your translation job. Language Transcreation is one step further than language localization in which the human transcreator translates the source text and adjusts supporting images to maintain cultural and emotive meaning across both languages and cultures. 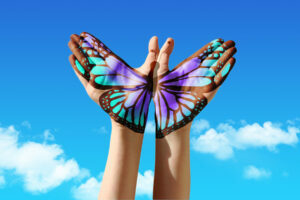 Marketing and PR firms prefer transcreation for their branding projects in new markets. An example of how transcreation goes beyond translation and localization might be the fact that word plays and metaphors in the source language would be adjusted to communicate the same sentiment in the target language. Additionally, if a particular line of persuasion is effective in the source culture, it must be evaluated because it may not be equally persuasive in the target culture. If it is assessed to not be equally persuasive, the transcreator would make a change in the line of persuasion to fit the target culture better. All texts that will be used in legal proceedings or for legal purposes must be certified translations by an institution or translator that is qualified to provide legal certification for the translation. Common Ground International provides certified translations for any text you need to stand the legal test. 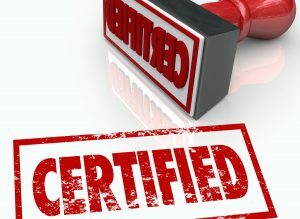 Common examples of documents that need to be certified are: marriage certificates and birth certificates used for citizenship or naturalization proceedings and for visa applications. 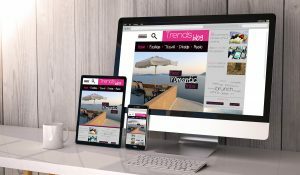 Website translation projects are essential for institutions, organizations and businesses that are working hard to serve their clients in another language. Website translation projects usually require localization and transcreation in addition to SEO work to ensure that your website is crawled by the search engines and served to your potential clients competitively. Common Ground’s translators are able to translate your website correctly and our website team is well equipped to make sure that your site ranks for competitive keywords in the target language. Marketing firms and small business call on Common Ground to help with their marketing, promotional, and informational video or audio pieces that need to be translated and voiced-over. 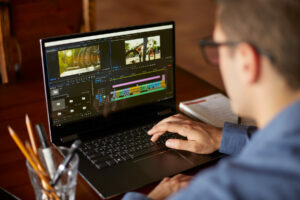 Our team of translators and professional voices will work together with your technical team to make sure that your original video or audio project is understood in the target language you’re hoping to connect with. Document Translation, Localization & Transcreation Services starting at $0.14 a word! Common Ground specializes in the highest quality translation services for Medical, Legal, Human Resources, Business and Marketing documents. Our process for document translation follows a standard procedure every time to ensure the highest quality translation for your job. 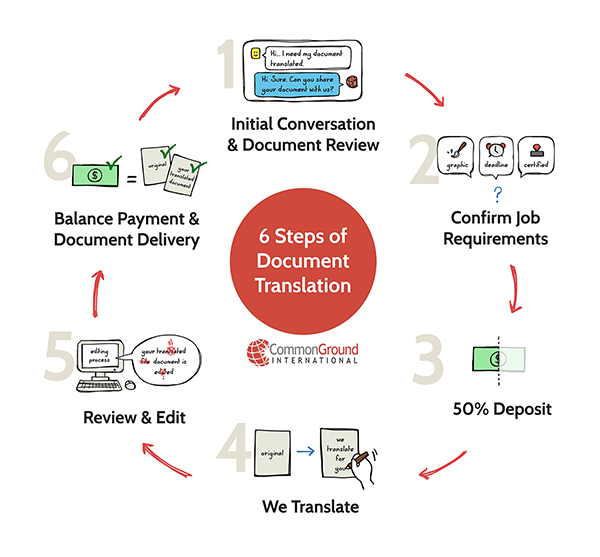 This 6 step process ensures that we provide you with realistic estimates for cost and turn-around time, eliminate errors in the translation, and keeps you a happy and satisfied client. We’ll have an initial conversation with you about your document that you need translated and ask you to share your document (or a sample of it) with us so that we can give you a word count and turn-around time estimate. We clarify your requirements for the job to understand your needs: if you need graphics or layout work with the job, how soon you need your document back, if you need a certified document translation. We’ll give you the final word count, request your balance due payment, and return your document to you. We’re a local business in Denver, CO – but we are happy to work with you wherever you are located! What kinds of documents do you translate? We translate all types of documents, but some common document translation examples are: public health brochures, patient consent forms, marketing pamphlets, instruction manuals, employment applications, terms and conditions forms, websites, birth certificates, marriage licenses, health forms for travel visas, etc. We accept all of kinds of document formats including doc, pub, pdf, jpeg, zip, and many more. How do you bill translation jobs? The industry standards for billing translation service jobs are to bill by the word in the target language. The “target language” is the language you’re translating your document into. The charge per word varies greatly on many factors: complexity of the document, the source language to target language combination, and turn-around time are some of the most important factors. Our rates start at $0.12 per word for general language translation projects (usually personal documents) with a normal 3-5 business day turn around. Small translation jobs incur a $30 minimum charge. If you need a document next day, you can expect to pay around double what the normal charge would be. If formatting and artwork are required, those are generally billed on an hourly basis. What is the average turnaround time for translations? Why should I choose Common Ground International for my translation needs? Common Ground International provides efficient and high quality language solutions. We work with a small and experienced group of certified translators who are native speakers of their target languages. These translators not only have years of experience in their industries but also of working with Common Ground and adhering to our high standards of quality. Who actually does the document translation? Professional translation jobs require a professional translator. The industry standard in the United States for professional translators is the certification via the American Translator Association. This professional organization tests and certifies translators in specific language combinations. A translation “Agency” is a company that brokers translation jobs – they may not do their translations in house. 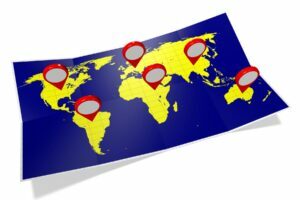 Many translation agencies choose to work with ATA certified translators who reside in Central or South America. This approach helps keep translation costs down for the client while maintaining quality translations. Why not just hire a translator directly for my job? Working with a translation agency (like Common Ground International) provides you many benefits. Not all certified translators are the same. An agency has deep professional relationships with translators who they have been working with for years. This assures quality, timeliness and predictability. If you have just a document or two here and there to translate, your translation job may or may not be given much priority. You don’t know how this person works, you’ll have to figure out how to pay them, and you’ll be taking a leap of faith that they can deliver on what they’re promising you. Additionally, a professional translation job requires more than one pair of eyes on a given document. If you hire a translator on your own, you’ll still need to hire a second set of eyes to edit the document. When you choose Common Ground Int’l as your document translator, we do all of this for you. What is the value of contracting with an agency? The cost of working with a translation agency is much less than the value you receive. Most clients who are looking to have a document translated aren’t interested in the business of translation – they just need their document back in the target language! Our agency takes care of all the “business side” of getting your job done and returns your document to you in the target language. An agency’s 15%-25% margin on a project is usually much less than the value of your time trying to ensure that you have a solid document translation product. What are the pitfalls of doing your own document translation in-house? 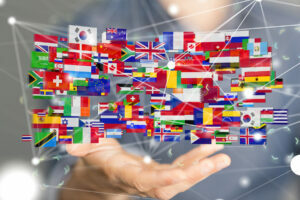 Many companies and organizations believe that their bilingual employee is capable of completing their translation job, and can be their go-to translator. This usually results in a poor translation. A professional translator makes sure that the tone of a document is communicated appropriately (not too casual or too formal – but matching the tone of the source document), can assure you that words have been spelled correctly, and furthermore doesn’t have other responsibilities at your company that are being neglected because they’re trying to do your translation job which they feel unqualified for. Why not use Google Translate or another mechanical translation? Google Translate and other online translators are fantastic resources when you’re translating individual words here and there. They are particularly useful when you are translating a sentence or two into a target language that is your primary language. This way you can see the translation and make a judgment call on whether or not the program provided you with a translation that makes sense. You can get into serious trouble if you rely on a mechanical translation to translate phrases, sentences, paragraphs and even pages of text into a target language that you’re not very familiar with. You have no way of knowing that the translation is accurate, and these free mechanical translation services and online translators often aren’t accurate. It’s always best to use a professional translator like Common Ground International.